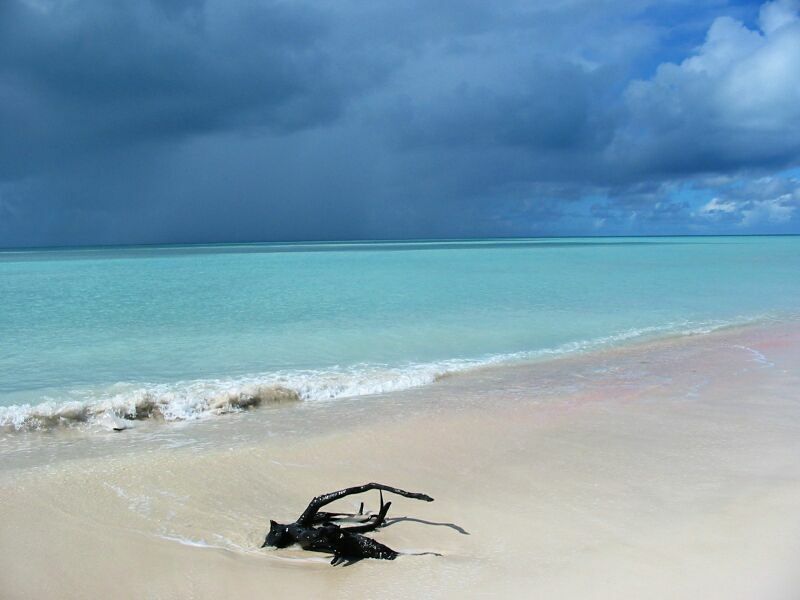 Antigua and Barbuda are part of the British West Indies. They are one country, so you only have to enter customs in Antigua and so you can visit Barbuda without worrying about customs. 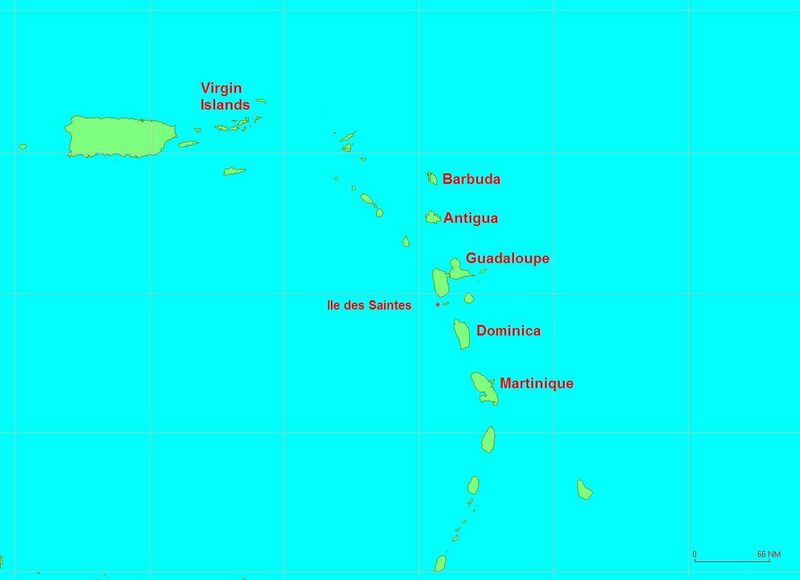 But, about 30 miles separate Antigua and Barbuda. 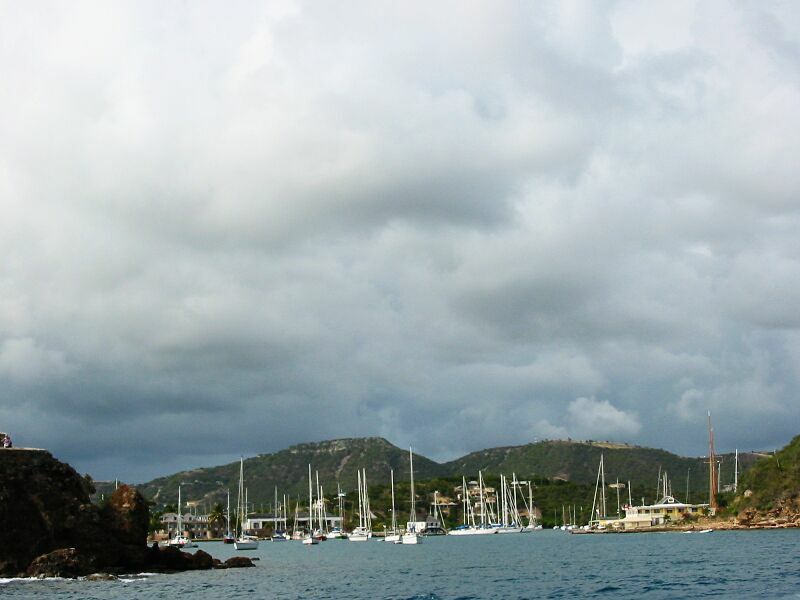 We arrived in Antigua in the early afternoon after a nice sail from Montserrat. We chose to enter English Harbour and we motored down the entire harbour - both to look for a good place to anchor and to see the sights. The harbour was pretty full as many people had heard about approaching big seas in the forecast due to a gale in the North Atlantic. We decided to anchor near the beach at the first part of the harbour with plans to leave after doing customs. English Harbour is a very famous place, at least if you are into naval history, as it was the harbour run by Lord Nelson, the English Navy admiral who fought many successful naval battles in the 1700s. In fact, they named the dockyard in English Harbour: Nelson Dockyard. Nelson's final battle was the Battle of Trafalgar, which he won, but tragically was shot by a French assasin after the French had surrendered. English Harbour is now a historic site with a nice museum and many preserved buildings and nautical items, chandleries, marinas, shops, and restaurants. Frank went ashore after we put down the dinghy and found customs and the port authority. Antigua cost us about $50US to enter. This included up to a week's stay in the two primary ports, which we paid for since we weren't sure what the seas were going to do. After clearing customs, we moved over to the adjacent bay called Falmouth Harbour. This is a larger area, and although it had many more sailboats, there was room to anchor without trouble. There were also many more mega yachts than we'd seen at any other location in the Caribbean. Possibly as a result of the mega yachts, we found prices in the area of the two main bays were a bit high. Groceries, yacht supplies, and books were all quite high. In fact, we ended up paying $12US to buy a Sunday Times (London) newspaper. On the second day, we walked over to Nelson's Dockyard and visited the museum. Frank is really getting interested in naval history and actually visited the museum longer than Karen or the girls. 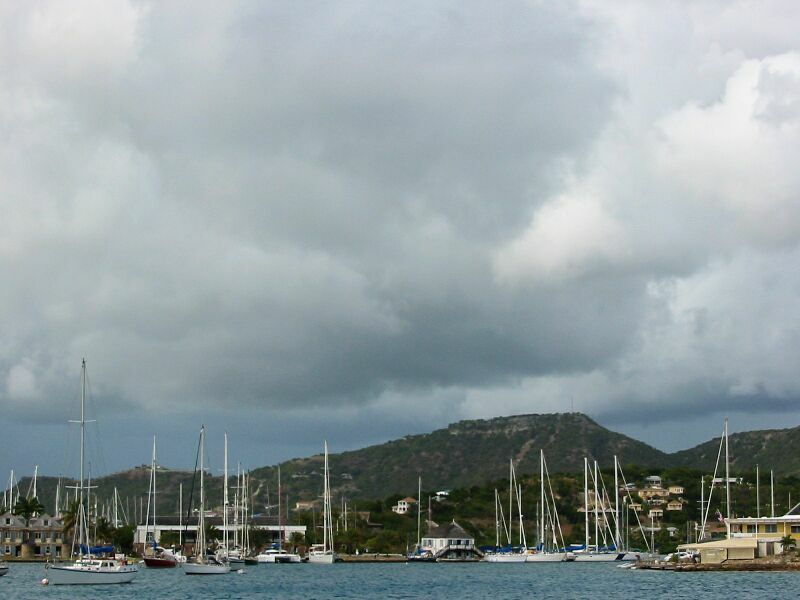 Antigua is also famous for Antigua Race Week - a race of classic and mega-yachts during late March or April. So, there were lots of stories and trophies from the races which started in the 1960s. Fortunately, after staying a couple of days in Falmouth, the weather forecasters were both pleased, and surprised, that the rough seas never made it to Antigua. As a result, on Monday - January 27th - we left Falmouth to move to Jolly Harbour on the NW side of the island. This was about 11.5 miles away, and we had a nice sail first down the south side and then up the west coast (the island being kind of square on that side). Up the coast was thrilling as it was on the lee side and the seas were flat, also the water is shallow there, so we were racing along at about 9.5 knots in 20 feet of water watching coral reefs flying by underneath (a bit unnerving actually). But, the charts were correct and we arrived at Jolly Harbour with smiles on our faces. Jolly Harbour is relatively new - about 10 years old - so new, our electronic charts didn't show the channel and new harbour and marina that has been added. We found out about it from our friends on Hotel California, and upon our arrival we picked up a mooring right next door to them. Wilson gave Frank a quick summary of what was available and where. The good news was that for the nice price of $10US a night on the mooring, we got access to showers and a swimming pool! So, a bit later we took advantage of both, with Hotel California's family joining us at the pool. We BBQ'd some burgers that evening and had a nice stay there the first night. The next day we first took some laundry to a nearby service, and took fresh showers. Then, after a quick lunch, we went to catch a bus and go to St. John's, the capitol of Antigua. There Frank found an Internet cafe with ISDN that let customers use a laptop and he updated the Paticat web site. Meanwhile the women did some shopping. Frank went back and picked up the laundry (already done - washed, dryed and folded) four hours later - and it only cost about $40US for 4 loads. Hotel California was planning to leave the next day for Barbuda. We only had one day we could afford to go there, and after some discussion we decided we'd leave the next morning (Wednesday) as well and return the next morning (Thursday) back to Falmouth Harbour. We needed to pick up a propane tank and a letter with a new copy of our vessel document (has to be renewed annually) before we cleared out of Antigua for Guadaloupe. This had to be done on Friday. Since we decided about Barbuda on Tuesday night, after the marina closed, we had to wait until the office opened in the morning to pay our mooring fees. So, we got up and took another shower and then paid our fees. We left by 9:30 and had a really nice sail up to Barbuda. 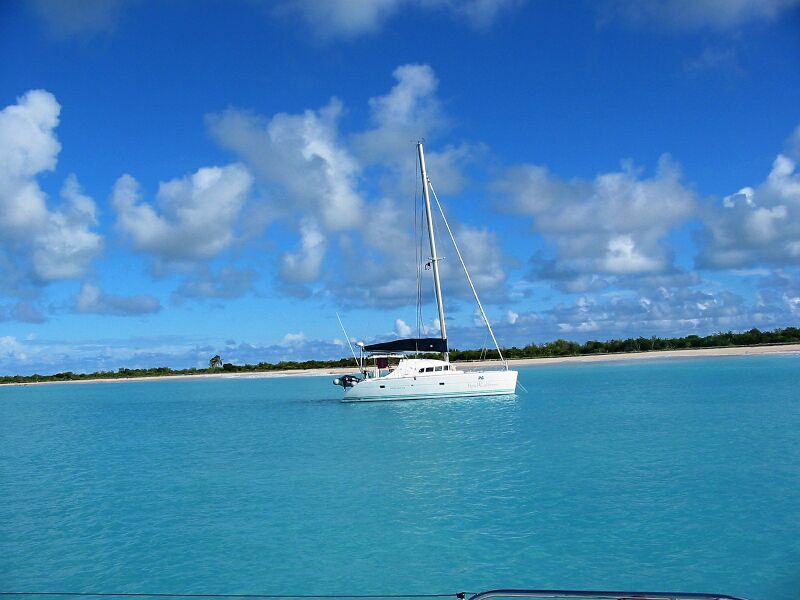 We averaged 9 knots the whole way to Barbuda. 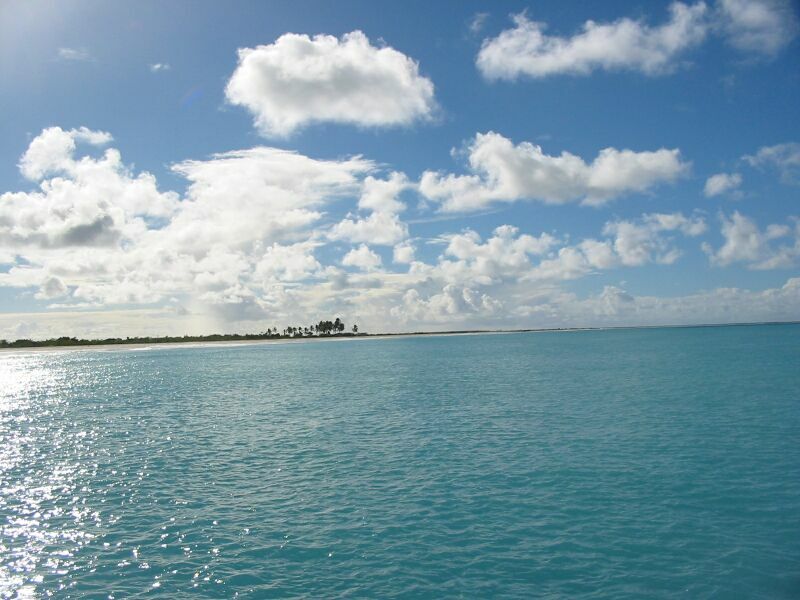 Barbuda is somewhat similar to Anegada. It is a flat island, and has a low population, and is located out of sight from the main island. It has two very nice attributes. 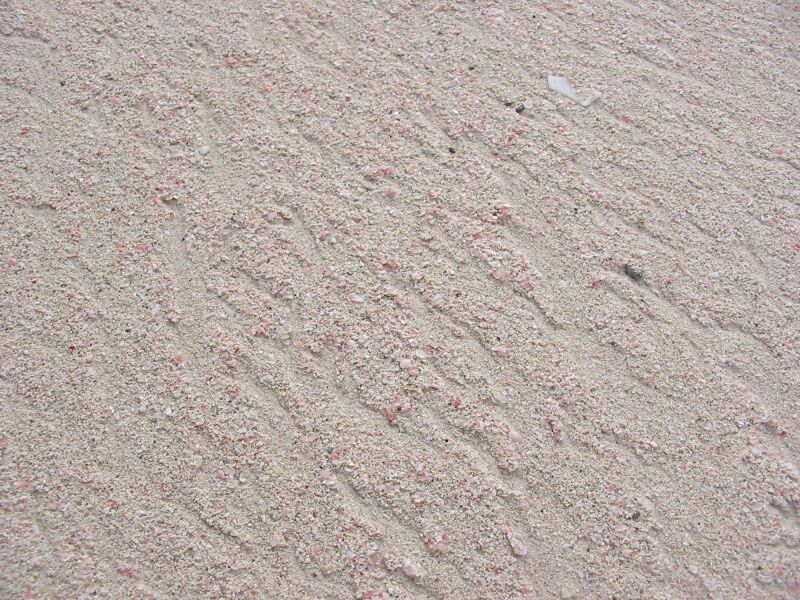 A beautiful pink beach - yes, it really is pink - there is a kind of limestone tinted with red/pink color which is broken up on the beach. The beach is called 11 Mile Beach for obvious reasons. The other nice attribute is a huge frigate colony (birds with huge wings to body weight ratios). The colony is located in the middle of a large lagoon in the heart of the island. You have to hire a motor taxi to get close to it (it's a law). Once we got to the SW corner of the island, we sailed right up this beach to where Hotel California was already anchored. In the lee of the beach, the seas were flat and we zoomed along at up to 10.4 knots. Fun! We arrived at about 2:00 PM. It turns out Frank and Karen were a bit under the weather - probably something we ate. We kind of holed up on the boat, while the girls went to play with Lindsey mostly in the water and on the beach. Here are pictures - first of the 11 mile pink beach, a picture of Hotel California at anchor next to us, a close-up of the pink beach, and a shot from the beach while squalls were passing. The next day, Frank and Wilson went on a hike up the north side of the beach and ended up within a couple of miles of the frigate colony (as close as you can get without hiring the water taxi). After walking back, Frank rounded up the family and we left by 1:00 PM to sail back to Falmouth Harbour. It was hard to leave as the beach was delightful! We said a hasty "Au Revoir" to Hotel California as we were already leaving late given the sail we had ahead of us. It was a pretty good sail down with only one tack needed to make sure we went down the east side of Antigua. This assured we'd have the right winds to sail down the south side over to Falmouth. The sun set as we got to the NE side of Antigua, and we went the rest of the way in dark conditions. But, we managed to sail all the way to the entrance to Falmouth Bay with an arrival time of 9:15 PM. We anchored the night in Falmouth, and the next morning we got the vessel docs (thanks Zenda for sending them! ), the gas tank, and cleared out of customs. We left a bit later and were out of the bay at about 10:00 AM. Our next destination was Guadaloupe. 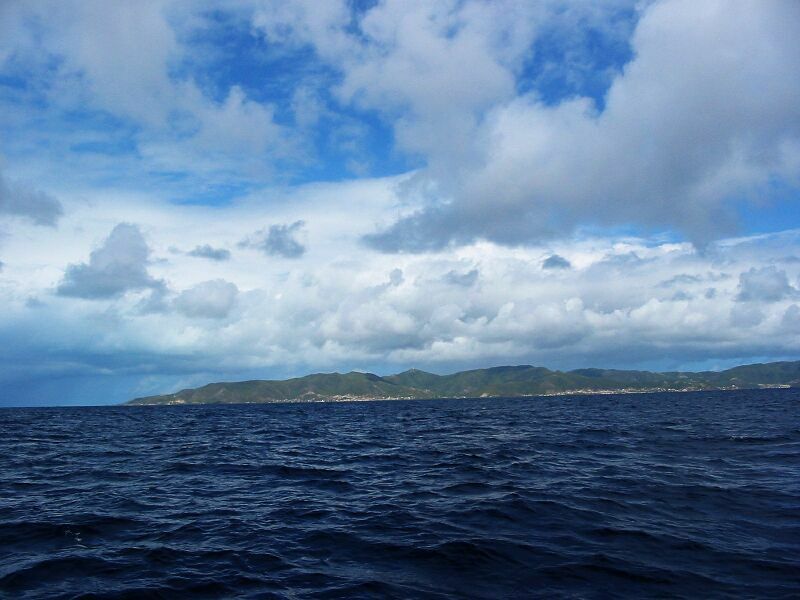 We had a nice sail (well, it was a bit choppy at first, but it got better as we approached Guadaloupe), and pulled in at about 4:00 PM into Anse Deshaies (pronounced 'day hay').